According to the 2014 identity fraud report issued by Javelin Strategy & Research in March of 2015, $16 billion were stolen from 12.7 identity theft victims. The details behind these numbers teach us a lot about the threats facing consumers and businesses as well as areas of exposure which Certified Identity Protection Advisors can leverage to help their customers for preventing and minimizing the consequences of identity theft. It appears from the Javelin Strategy & Research’s 2014 Identity Fraud report that although the number of identity theft victims was slightly lower than in 2013, that number was slightly higher than reported numbers for 2012. 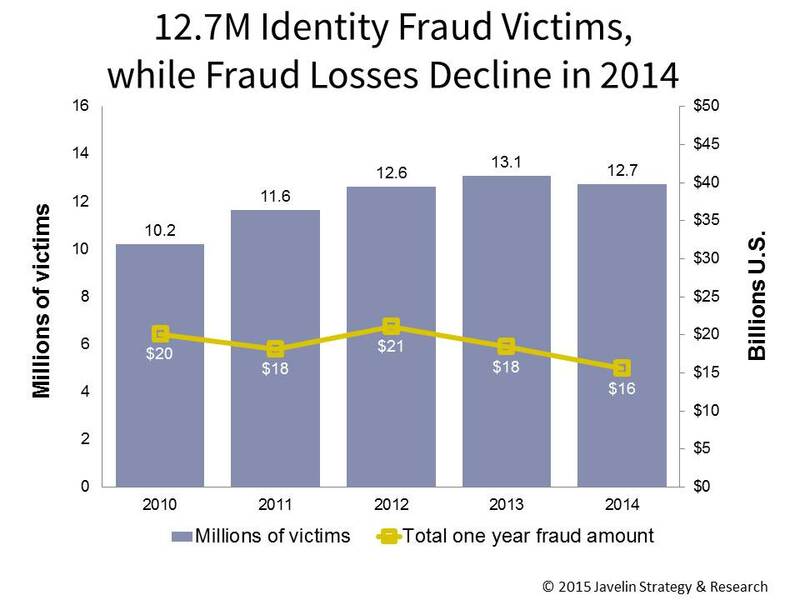 Fraud losses were also lower when compared to 2013 from $18 billion to $16 billion. Increase in consumer awareness and improved security measures implemented by businesses definitely play key roles in the reduced identity theft fraud numbers, but we still have a long road ahead of us. For example, the 2014 identity fraud report indicated that students who happen the be the most affected category by identity theft, also happens to be the least concerned about identity theft. The lack of identity theft on the part of students may also play a huge role in the lack of monitoring their credit reports which makes students a prime target of identity thieves. Data breaches also impact businesses in more than just one way. In addition to lost productivity and reduced profits, 28% of identity theft victims say they avoid businesses which experience data breach incidents. Therefore, bad publicity is not always good which means that many businesses may be hesitant to report cases of identity breach incidents fearing that their customers may run away. As everyone knows, 2014 witnessed some of the largest data breach incidents which ultimately affects banks and other businesses. We have previously discussed the ripple affect of identity theft and how an incident in one business can have devastating consequences for another business which is what the Red Flags Rule attempts to alleviate. We all know that all the good security practices will not prevent a company from experiencing a data breach, and although the government can sue a company for poor security, the Red Flags Rule regulation was created to prevent identity fraud regardless of where the information was stolen from. We have discussed before about the impact of a downward economy to identity fraud especially people with less financial power. Previous reports have confirmed that fraud victims living below the poverty line are more likely to personally know the fraudster than individuals living above the poverty line. This is mainly due to financial necessities which forces people into committing fraud by preying on easy targets who happen to be their closest friends and family members. Often, people we know and trust have easy access to our personal information. There are two other important take away points from these reported 2014 identity fraud report numbers. First, the good news is that new account fraud is down, but the bad news is that it takes longer to detect fraud. Consumers are encouraged to review their credit reports from time to time or sign up for automated notification services. Consumers should also pay attention to data breach notification letters they receive from businesses because not only they can take measures to monitor and prevent fraud but also consumers can take advantage of free monitoring services that companies offer to their customers after they realize their customers' personal information has been stolen. Businesses must also be aware of the identity theft trends to be more diligent with identity theft management and validating their customer identities when processing new account applications or transactions. Identity theft schemes are planned and executed using pieces of personal information which are gathered over a period of time and not all at once. As consumers and businesses protect their personal information, data breach notifications must be quick and properly leveraged to minimize identity fraud cases and costs. The consequences of identity theft not only affect the victims and the banks who must cover the majority of identity fraud costs, small retailers and online businesses also suffer as consumers lose faith in the security of their personal information and integrity of transactions. Become Certified Identity Protection Advisor after reading the 2014 identity fraud report analysis.